To meet the demand for a chassis larger than his established three-litre to carry closed luxury coachwork, w.o. 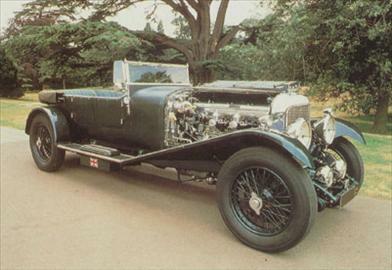 Bentley introduced a new 6.5-litre, six-cylinder model in 1926. Its engine was mounted on rubber pads to limit vibration, and three wheelbases were offered, enabling customers to fit anything from a two-seater to a hearse body. Performance (est): Top speed of 100 mph engine typedrivetrain: Water-cooled, overhead-cam, 6-cylinder displacement 6,597 cc (6.59 l) power rating 160 hp transmission 4-speed manual chassis: Channel-steel; Front and rear suspension by semielliptic leaf springs; 4-wheel drum brakes; 3,960 lbs. Sports derivative but bentleys sporting heritage would not be denied and soon there was a sports derivative of the new six on the market. Known as the speed six, it had a higher compression ratio than the standard six, and two su carburetors instead of the single multijet smith carburetor of the less powerful car. Out of 544 6.5-litre bentleys built, 171 were speed sixes. victory at le mans it was at le mans, where bentley cars had already won three firsts in 1924, 1927 and 1928 that the speed six gained its greatest glory. Its 1929 victory was particularly spectacular, for the speed six driven by bernato and birkin led three 4.5-litre bentleys across the finish line in a 1-2-3-4 clean sweep. Another speed six won in 1930 after an epic tussle with caracciolas supercharged mercedes. Twice a winner at le mans, the bentley speed six was the archetypal british sports car of the late twenties.